Thereby the already ligthweight harness offers the advantage that no separate packsack with additional weight is needed anymore. The packsack of our reversible harness is big enough to store a complete paragliding-gear, and because of it´s compact shape it is very comfortable to carry and offers a good load distribution. A total innovation at the Emotion is the rescueparachute-innercontainer with it´s integrated release-handle (this container is availabel in several sizes). Up to now the release handle and the innercontainer were two separate parts, which have to be combined first, usually by stowing. Not so at the Emotion: Here the release-handle and the innercontainer are one unit! 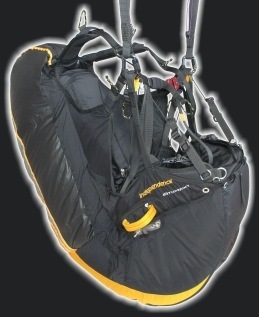 Thereby the installation of the rescue-parachute to the harness is defined more clearly. A wrong mounting of the rescue-parachute to the harness, for example caused by a wrong fixing of the handle to the innercontainer, is not possible anymore! Of course the Emotion is equipped with a dual-chamber airbag-protector and is certified according to LTF (german type approval) and EN (European Norm). Target group of the Emotion are not only alpinists who usually walk up to the take-off, but also all other pilots who follow the trend to lighter harnesses without making any compromise regarding the functionality and comfort. The Flash is light, compact and the anatomic cut enables a perfect power transmission from pilot to the canopy. The Flash offers best flight quality and a high level of comfort. It give the pilot a very exact feedback about the movement of the wing. Passing-through shoulder belts give the pilot even in an accelerated flight a comfortable seat position. Complete with mousse back protector and Austrialpin stainless steel carabiners. 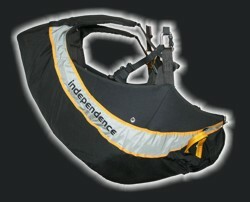 The Spider is the most sportive open harness in the Independence range. By it´s aerodynamic shape in combination with a very direct and low suspension it offers the pilot a optimized glidercontrol with a very comfortable seat position. The rescue system is intergrated at the front under the pilot´s seat, which makes the complete harness even more compact. 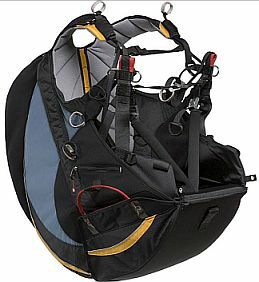 Generous storage space, passing-trough shoulder belts, DHV-certified protector and AustriAlpin steel carabiners are of course included. The Spider is made in perfect quality by high-end materials such as Cordura and special Nylon-fabric. Out of this reason it is also very light. So the weight of the medium size is just only 5,7kg including steel carabiners!! 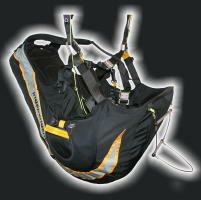 The spider is first choice for thermal- and XC-pilots who are looking for a very comfortable but also sportive harness. Available in the stylish colour combinatin black/grey with orange decolines in four sizes. lighter, sleeker & more aerodynamic and comfortable. The new XC harness from Gin Gliders is ready! The new Genie III is lighter in weight than it's predecessor, the famous Genie II, and incorporates all new Gin R&D technology to give a compact harness for pilots looking for performance, comfort and highly precise piloting..